My mom called me the other day. 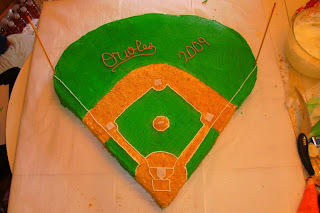 Would I make my cousins daughters cake for her 4th birthday. I asked what she wanted. "anything horses, she loves horses or My Little Pony's"
So I racked my brain (this was a quick endevor) and this is what I came up with. Buy a color book and do something out of it. Yep, I pick the easiest one. I am lazy after all. Today started off with a PTA meeting. Then I had to go grocery shopping. Then I came home to get the cake done. This is not easy with 4 kids wanting to 'help' or watching your every move. OR standing there with drool falling from their mouths while they wait for a slight bit of icing to drop. I started out with 6 cakes in 2 cake pans. The kids were SOOO not impressed. Until they started to see it taking shape. Finally after about 9 hours and 2 days I got done. I made 3 batches of icing. mixed up 9 differnt colors of icing. OH yeah. I am tellin you, I LOVE this picasa!! its amazing. I have never been able to keep up wiht pictures like this. I am learning how to use it and this thing is IDIOT proof. Believe me. I am living proof!! All of thse pictures were even sent here FROM it. If it contiues to be as great as it is, I will be able to say that every cloud has a silver lining. I didnt mean to abandon y'all. My 'puter has tried to die. It kept doing weird stuff, so being the computer guru that I am I decided it was time to reinstall XP. BAD move... I did TRY to save everything, BUT apparently was unsucsessful. BUT the dad gum thing STILL wasnt working.. So I went to a website, got some free tech help. They said it probaly needed cleaning. But told me not to do it. You should always take a laptop to a certified professional. WELL, again, in my infanite wisdom I decided that any idiot could dust the inside of a computer. even those that swear to our husbands that we CANT dust a ceiling fan cause we are too short. I mean I fixed a dishwasher didnt I? the kids had their last game, Matt did great, although he was hit in the knee by a line drive and we thought he had broken his leg. Once we fiqured out he could walk again BR asked if he wanted out of the game.. (he was coaching) Matt said NO. and made a great play a little while later! I was very proud of him. He had been crying and in obvious pain. Brett did a very good job too. We did loose, by one point. But both boys got hits, caught balls and got outs. The team played better in the last few games than they had all dang year. I made a VERY large cake. THis took a few days. the board its sitting on 3foot by 3 foot board. I had asked BR to cut it, the next day Rayley and I did it. She really did help me. I measured it out and she held the plum line thing while I snapped it. Then we fired up the table saw and cut it. It was 10 cakes, 2 per pan and 5 pans. I had to get my grandfather to come over in his car and we loaded it into the trunk. It was the only way to get it to town. Brett popped a kid in the mouth after the game was over. He had been hitting everyone in the dugout, cussing them, plus various other stuff during the game. And everyone on the team had wanted to do it for most of the year. and then hit Matt on his bad knee. He then proceeded to step on Bretts feet and bump chests with him. According to witness' Brett told him to step away. He didnt, so Brett let him know he was serious. It wasnt a fight. It was one off center punch and the kid folded like a lawn chair. I dont even think he bled. The shock is what got him. Noone else has ever hit him before. He just gets away with torturing everyone. We fiqured it was over. Till the next day at school. The kids MOM came into the classroom, and told Brett "you have it comming" Brett asked "what?" she said " You'll find out, Pete knows what it is, and you'll find out"
Now, come to find out, Petes twin sister was going to beat up Brett at school on Friday. The last day of school. being the true Redneck I am it took alot of will power to just call the school. I called the principal at home. Told her and said that nothing had better happen. It was somewhat taken care of, there was no fight. The mom didnt even show up for the parties on Thursday. And I didnt land in jail either. Of course, on the last day of school, which I didnt attend, she did show up, and managed to threaten Matt in the same manner, but since he was leaving to go home he didnt try to talk to anyone about it. The case is not closed, but I am attempting to not become a Jerry Springer contestant, so I am trying to deal with it in a way that goes against the grain.. 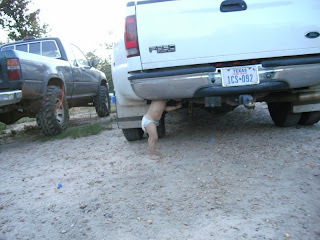 Lets see... what else... OH, babies!! NO NOT ME! Since the kids had their last ball game, then the last few weeks of school, its been pretty busy around here. They had their carnival at school, I got to take Rayley and she got to play while I worked the concession stand. The school really puts on a great carnival for the kids. The blow up things you run and jump on, face painting, bowling, and lots of various other games. I am trying to remember everything we have done. Oh, I put up pert near 40 quarts of taters. Of course before I could wash, cut up , boil, and pressure cook them, we had to plow them up and pick them. It was a bad year for taters. They should have been out of the ground a month ago. We didnt get near as many as we should have. We planted enough to feed an army. The kids helped me alot. We all pulled, BR took off that morning to help. Then the kids and I put them up. Rayley helped to wash, and she really did stand at that sink and wash every tater. The boys cut them up. They did a pretty good job, but it wasnt very uniform, and they played alot. I finally finished thosearound 1am. Bow has really enjoyed having the kids home and so has Rayley. If I give them the chance they are out the door and playin. Bowdrie too. He follows them everywhere and refuses to be left inside while they play. BR and I went grocery shopping on monday. with all 4 kids. 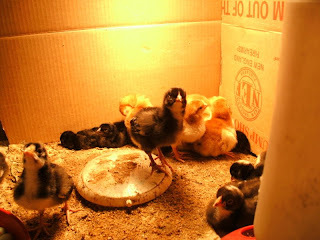 then we went to Lowes and got the stuff to put a switch out in the coop/sty. 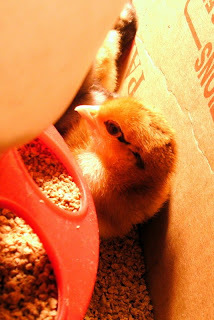 that way I could put the new chicks out there in their brooder and not have the actual lights on all day and night, just their heatlamp. We decided to put a light out at Wilburs pen too. So we got all the stuff we needed and came home. Then it dawned on BR. we had forgotten the actual flood light assembly... I had to drive the 20 miles BACK into town to get it. 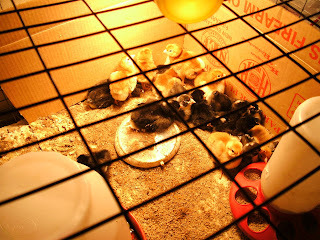 But we did get it done and got the chicks out of the house. OH, here are some pics of them. About 40 eggs, and we had 24 hatch. I might have had more hatch,but took them out pretty quick after the last hatchers, I was scared of a rotting egg. 3 of those didnt make it much past hatching, so I ended up with 21. I am soooo glad that they are outside, and hope they are safe. But I am mostly just glad they are outside! dont you just love this ones markings? Once they were out of the incubator, my sister in law brought over a bunch of quail eggs (they are SOOO tiny!!) 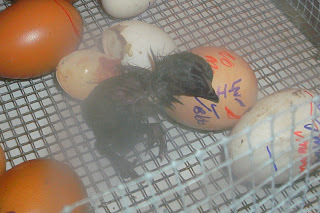 and a few more chicken eggs, so I am back in the hatchin business. I hope. today we lost power for a few hours, thats not a good thing for hatchin eggs. you HAVE to keep a steady temp of 99.5. They had a blast, Rayley really enjoyed it, she is fearless anyway, and has always loved riding the 4 wheeler. And anything her Uncle Luke does she will gladly try. They did relate a story to us. On the way home they were playing I spy. Luke was driving, Amanda was in the passenger seat and all three kids were in the back. Rayley right behind Amanda and then the boys in the middle and behind Luke. It got to Rayley's turn and she said "I spy two donkeys on my left." Amanda and Luke both tried to see them out the drivers side, then looked to the passenger side, since she is only 4 and might not know her directions yet. she just kept on saying it. "I spy two donkeys on my left"
At first they tried to tell her they didnt see them. then they just agree'd t humor her, and it was a few seconds before it dawned on Luke. Brett and Matt were on her left. 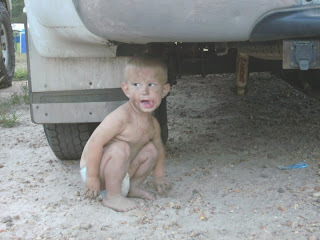 Amanda said he had to pull over he was laughing so hard. 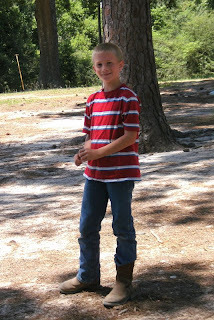 After everyone got home on the day before school was out, the kids stayed outside and played, when I got supper ready I went outside, The kids had been out playing basketball and BR had came home but hadnt made it into the house.They had roped him into playing P.I.G. 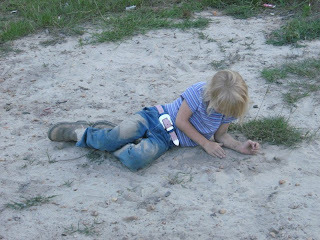 Rayley and Bow were just running around playing in the dirt. Well, they said he was. It took a second to find him. BR had just been bitching at me about driving full speed up our driveway that has ruts and holes the size of the grand canyon in it. Telling me how I was ruining my shocks.. I thought that was what shocks were for.... Apparently Bow decided to check them out. Yes, he is in a diaper. BUT HONESTLY, do you want to have to wash clothes that look like this 3 or 4 times a day? Cause that is what it would be. Hell, what do I care. Judge all you want. when you get to # 4, you realize, cute clothes and adorable presentable babies laying in your living room floor are something magazines show you to make you crazy. DOnt get me wrong. If we go to town, my kids all have on shirts, pants, socks and shoes. And they are 99.8% of the time very very presentable. BUT, at home, we dont get all formal. Aint no sense in dressin nice for the hogs. 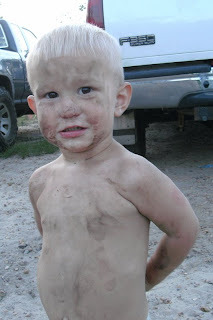 Even Rayley aint afraid to get dirty. 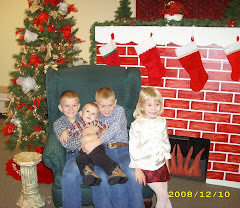 Here are pics of my babies on the day before school was out. I cant belive they will be in 5th and 4th grade next year. Brett is going into 5th. He is my biggest help. I dont think I could do half the things I do with out his help. THere are times when he is the north end of a south bound mule, but he does have a heart of gold, and goes out of his way to help you. He got all commended on his taks tests. (Matt got one commended and scored high on the other) But that brings up another subject. WHY if you can get commeded on a taks test, do you never even TRY during the year? and thats all it is, he doesnt try. It is true that the years fly by. Sadly, I cant sit here and remember them when they were little. I think my memory is faulty. I dont remember their smell, or the way they felt. I hate myself for that, I can remember snippets or something that happened, a small story, or a funny thing they did. I am just glad that there are times when they are still willing to set in my lap and hug me. At least until Bow sees them and pushes them out. But, I googled "free picture resizer" and this program came up called Picasa 3. I DownLoaded it today. I havent fiqured out much on it yet, I cant get the MB of the pics down to a workable size yet, BUT, I love the way I can organize the pics, and it seems to be a pretty smooth program, I cant promise its a perfect program, but it seems pretty neat so far to me. and it will upload a picture strait to your blog! I did fiqure out how to resize the pics, and you can do an entire FOLDER full at once!! OMG! that is SOOO nice!! I also got a call, my cousin wants me to make her 4 year old a cake for her birthday. Anything to do with a horse. She loves horses. Stupid me, I said yes. Then I had to come up with what I was going to do. But its my first paying gig. 35.00. that paid for supplies, so I am happy. I promise to post pictures. I hope to get it done pretty soon. its due Saturday, BUT, tomorrow I have a PTA meeting (yes, we work through the summer..... ) and I have snap beans to pick and more than likely maters to stake and work on. possibly corn to pile dirt on. We got a torrentail downpour today, nigh on 3 inches. it tore down some folks corn fields. I know our maters are drowning in water, as are the cukes and okra. The corn didnt have much dirt on it to start with. Speaking of the dishwasher. We did get it going. Then I went to use it the next day. It wouldnt work. Froze up again. So, I taught Brett how to turn off the breaker, unscrewed the bottom panel and turnedthe motor a few times, had him pop the breakers and it started right up. We did this for about a week and a half. A slight pain in the rear, but MUCH better than handwashing dishes. I didnt tell BR I was having to do this. Cause his solution would be to buy a new one. Yesterday when we did all those taters I had alot of dishes from the day before, and the kids eating all day (while I was TRYING to cook,) and I also decided it was a good day to clean out the kitchen. And I mean EVERYTHING. I cleaned blackskillets, pots, pans, things we never use, you name it we spent 4 hours cleaning it. I ended up running 5 loads through the dishwasher and it started up each and every time. That is a beautiful feeling. I need to take the motor out, clean it up real good and regrease it. The grease goes bad after a little while and starts to literly gunk up the works. Now between writing this, cleaning the kitchen, getting the house to bed, and having to read the instructions to learn to resize a picture its after 1:45 and I have to be up by 6 to get to the school for my PTA meeting... So I am going to BED!